Epson America, Inc. announced the addition of seven new EcoTank all-in-one printers to the EcoTank line today, including the new Expression Premium models that come with a five-color ink system for better photo and document print quality. What makes the EcoTank printers so different is the lack of traditional ink cartridges. Instead, the printers have integrated ink tanks that can be easily refilled from specially-designed bottles. 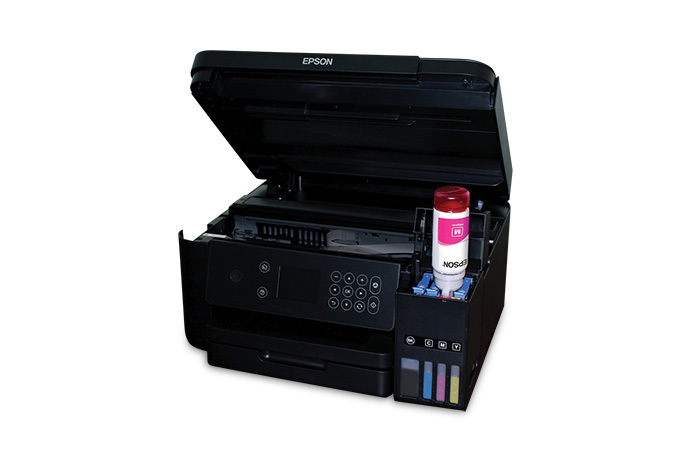 Each printer is shipped with about two years of ink in the box, which Epson says is equivalent to about 30 ink cartridge sets. The printers can save users a lot of money in the long run. For example, I currently use an older Epson WF-3540 all-in-one that uses ink cartridges. Every time I need to change out a set of cartridges, I'm looking at about $85 for the super-capacity black, yellow, cyan and magenta cartridges. Sadly, I usually have to replace them twice a year although I don't do a tremendous amount of printing. For a similar EcoTank printer and a reasonable amount of printing, it's expected that the ink that is shipped with the printer will last about two years. Once a refill is needed, the ink bottles are quite inexpensive -- $40 for all four colors. For my personal situation, that means saving about $65 per year on consumables. People or organizations that do a lot more printing will see even more savings over the long run. Can print 6,500 pages black, 5,200 pages color before ink replacement, 100 sheet paper bin, print/copy/scan, Wireless/Wi-Fi Direct/Tablet/Smartphone/Ethernet connectivity. $279.99 MSRP, available online only. Button panel user interface. Can print 6,500 pages black, 5,200 pages color before ink replacement, 100 sheet paper bin, print/copy/scan, Wireless/Wi-Fi Direct/Tablet/Smartphone/Ethernet connectivity. Has a memory card slot and can do auto 2-sided printing. 1.44" color LCD user interface. $299.99 MSRP. Can print 14,000 pages black and 11,200 pages color before ink replacement, 150 sheet paper bin, print/copy/scan, Wireless/Wi-Fi Direct/Tablet/Smartphone/Ethernet connectivity. Auto 2-sided printing, 2.4" color LCD user interface. $370.00 MSRP. Can print 14,000 pages black and 11,200 pages color before ink replacement, 150 sheet paper bin, print/copy/scan, Wireless/Wi-Fi Direct/Tablet/Smartphone/Ethernet connectivity. Auto 2-sided printing, Automatic Document Feeder, 2.4" color LCD user interface. $399.99 MSRP. Can print 14,000 pages black and 11,200 pages color before ink replacement, 250 sheet paper bin, print/copy/scan, Wireless/Wi-Fi Direct/Tablet/Smartphone/Ethernet connectivity. Auto 2-sided printing, Fax, Automatic Document Feeder, 2.4" color LCD user interface. $499.99 MSRP. Can print 14,000 pages black and 9,000 pages color before ink replacement, 100 sheet paper bin, 20 sheet photo paper bin, print/copy/scan, Wireless/Wi-Fi Direct/Tablet/Smartphone/Ethernet connectivity. Auto 2-sided printing, 2.7" color LCD user interface, built-in USB and memory card slots. $599.99 MSRP. Can print 14,000 pages black and 9,000 pages color before ink replacement, 100 sheet paper bin, 20 sheet photo paper bin, print/copy/scan, Wireless/Wi-Fi Direct/Tablet/Smartphone/Ethernet connectivity. Auto 2-sided printing, 2.7" color LCD user interface, built-in USB and memory card slots. Prints up to 11 x 17" wide format. $699.99 MSRP.